A little knowledge is a dangerous thing indeed. But in the time-starved, bullet-point world we inhabit, a great deal of knowledge can be much more dangerous, because attempting to share it with others runs the risk of losing the listener part-way through, leaving fragmentary impressions of what it was we were attempting to explain. In the subject of the art and craft of tailoring in men’s clothing, I believe this has happened on a global scale. Creating sufficient body and stability in the front and the lapels of a jacket is what separates tailored clothing from sportswear. The 1970s advent of fusing – stabilizing the front and lapels with heat-activated-adhesive interlinings – saved the average tailored clothing manufacturer a significant amount on labor costs and insulated them from the increasing scarcity of trained tailors. This last part is the real story here, because to create a basted canvas front garment requires real skill. But this skill is required in a half-dozen other critical areas of fit, comfort and durability in the jacket; to judge the product’s overall quality by how the coat front is made is to miss most of the story, like judging a cake by the icing alone. The first, and probably most threatening fact, is that fine quality tailoring is extremely difficult to recognize. Machinery makers like Kannegiesser of Germany and others have pretty much perfected the materials and processes that go into fused-front tailoring. No more delaminating in the dry-cleaning; no more stiff, rigid feel. In fact, in the store, the fused-front jacket may actually look better. Here we come to a critical fact: if the skill in constructing a canvas-front garment is second- or third-rate, as it will in a world of fewer and fewer crafts-people, the product might be an inferior one. Nothing looks worse than a bush-league canvas front with its attendant puckers, ridges, unwanted fullness, bumps and wrinkles. It’s the end-result that matters, not just the means. Saying it’s “canvassed” is one thing. How does it look? The construction of the coat front is no more important to the long-term comfort, beauty and durability of the garment than the construction of the collar, shoulders and armholes. It is understandable that the sheep – goat controversy around fused garments vs. canvas-front garments arises from the fact that fusers mostly machine-stitch these areas, and this, my friend, is the heart of it. Ask not “Is it canvassed?” but, “Is it hand-sewn?” If you really want to develop some expertise in this, read on, because here’s the low-down on hand-made. There are five major operations in making a jacket that, done by hand, result in a superior product. That is to say that these operations have never been improved upon by the invention of machinery, the way the sewing of the straight seam has been improved by the lock-stitch machine, for example. These five operations are responsible for the superior fit, comfort and durability of the “hand-tailored” jacket. All of them are centered in the top of the garment, around the shoulders and collar; and all of them are important in achieving better fit and greater comfort for the same reason: flexibility. A hand stitch is a continuous passage of thread through the cloth; the thread does not “lock” to a bobbin thread as it does in a machine stitch. The thread moves, expands and contracts with motion, remaining supple, creating seams which are at the same time tight, fluid and elastic, such as are needed around the collar and the armhole to give the wearer the most precise fit and ease of motion while retaining the ability to return to their original shape and dimensions. Colluding with the machine-make houses, sewing machinery manufacturers have devised “simulated hand” stitching machines of one sort or another. Take for example the Liba machine, devised to replicate the slip-stitch that holds a necktie together. Most factories now use Columbia or AMF edge-stitch machines to make an industrial replica of the hand-stitched lapel edge and lining seams. All of this is testimony to the ingenuity of machinery manufacturers, but the bitter irony is that, despite their ingenuity and effort, anyone who would recognize the hand work in a garment will also be able to tell fake from real. Whom do they think they’re fooling? In fact there are only a few places where you can see hand stitches. Most important are those at the seam around the collar and in the lining at the shoulder and around the armhole. You may, with some experience, be able to discern a hand-made buttonhole, and a hand-done edge stitch is nearly unmistakable. Interestingly, the way you can tell that these areas are hand sewn is by the irregularity of the stitches. 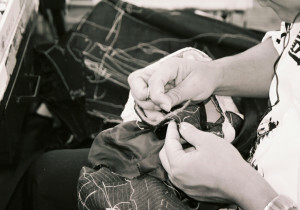 But strengthening the stress-points and achieving greatest flexibility in a jacket are best done by hand. 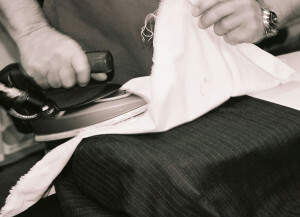 The true quality of a jacket is achieved by hand operations, most of which are invisible to the layman: 1) attaching the sleeve heads, lining and shoulder pads; 2) creating the collar; 3) attaching the collar; 4) sewing the lining in the shoulder seam; and 5) sewing the lining around the armhole. Now any truly hand-tailored garment is certain to have other areas of handwork inside, such as the tacking of the vents, sewing on the buttons, fashioning the buttonholes, stitching the lapel- and pocket-edges, attaching the lining at the sleeve cuffs and at the jacket-bottom hems; even the trouser waistband, when sewn to the outer shell by hand, creates a more comfortable and resilient fit and feel. The five critical jacket operations listed above are most important to the wearer is because those areas are where the comfort and stress resistance are most necessary, and where the hand-sewer can follow the elliptical, – rather than straight – curving sections of the cut cloth. The hand stitches follow and reinforce the contours of the collar and the armhole opening, giving strength and flexibility, smoothness and suppleness to those intricate seams. Do I hear snoring? Are you sleeping? Wake up! I’m trying to help you spend your money wisely. Don’t hold it against me. There are two additional things I will try to say as economically as possible; then you can shut the light. First, although hand tailoring is expensive in this world of diminishing skill, (there being so few people who are capable of doing it anymore that they can insist on very high wages,) there is still no way that anybody can justify the numbers some of these manufacturers or designers put on the price tags. If the garment takes 20 hours to make and the tailor gets even $50 an hour, you do the math. A $5000 suit is mostly mark-up, is all I’m saying. (Needless, is what I’m implying.) Caveat emptor, buddy. Second is this. You can’t tell the benefits of hand tailoring until you wear the jacket for a while. You certainly can’t tell in the store. A totally machine-made coat may fit well and look good, but after a while the comfort and durability, the garment’s ability to retain its shape, move with you and conform to your ever-changing dimensions, will be obvious.